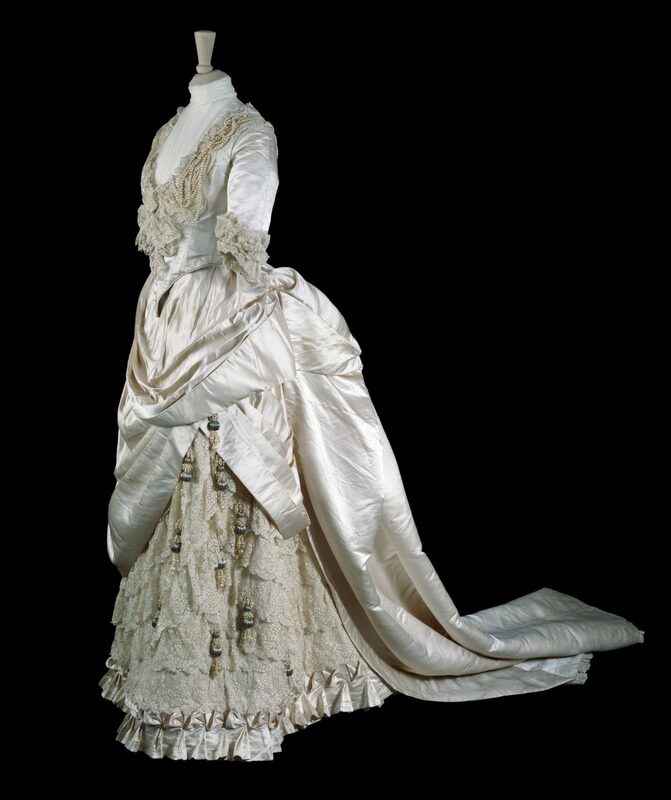 Perhaps a little unwisely, I have decided to commit to a weekly blog post in conjunction with our current exhibition Unveiled: 200 Years of Wedding Dress from the Victoria and Albert Museum, London. Wedding Gown of the Week will include gowns from the Unveiled and Te Papa’s own collection – the exhibition has spurred us on to exploring our own holdings – alongside some of the wonderful creations from Te Papa’s New Zealand Wedding Photo Gallery. The week’s wedding dress is from the Victoria and Albert’s collection, and quite surpisingly has a New Zealand connection. The dress was made in 1885 by Gladman and Womack, London based Court Dressmakers, for the delightfully named May Primrose. May Primrose married Henry Littledale at SS Phillip and James, Cheltenham. The couple then moved to India. Tragically, May died the following year on May 18 1886, following a riding accident. A family member living in New Zealand recently contacted me, thrilled to see that her Great Aunt’s dress was ‘out and about’. She commented that May was a gifted water colourist, and that the family still delight in her paintings. She also added a bit more information to the family story. In their short time together Henry and May had a daughter, Elsie. In a bizarre coincidence, Elsie, at the age of 18, also met with a tragic end while out riding. She was struck by lightening. Following May’s death in 1886, her belongings, including her wedding dress, were shipped back to England. The wedding dress remained in the family and was never worn again. Unaltered, it is a splendid example of the fashion of the time. The dress was gifted to the V&A in 1990 along with several other of May’s garments. For display the dress underwent conservation treatment, and a contemporary chemisette, corset and bustle cage were constructed to bring the gown back to its full glory – the latter of course was required to support the wonderfully elaborate drapery of the skirt. 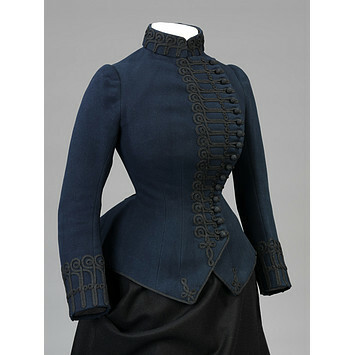 May’s family also gifted the above riding jacket and the spectacular ball gown below to the V&A. 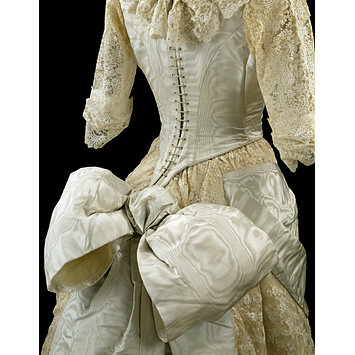 As with May’s wedding gown it was made in 1885, and reveals May to be a very fashionable young lady indeed.